I’m forever rearranging the items in my home office bookshelf. I have the large Ikea Expedit which is perfect for housing books, containers, photos, decorative objects, etc. Each cube is 12×12 so there’s lots of space to play with. While the contents of the bookshelf were generally very colorful, it used to be dominated by aqua. Now, I’m going for more pinks, blushes and golds in the bookshelf. Not wanting to purchase more magazine files, I opted to cover my existing aqua ones in wrapping paper. I’m a huge fan of Rifle Paper Co. designs and knew I would not quickly tire of looking at their latest floral patterns. In order to save paper- each roll only comes with three sheets and I had six files to cover- I opted to take a short cut and only cover the back and part of the sides. Sneaky huh? I’m thinking of adding bookplates to label them. For now, I know there are 3 House Beautiful and 3 Martha Stewart Living. With the striped paper, I covered a hexagon cardboard box I found on Amazon. They came in a set of 3 sizes and I was thinking of painting them a colorblock combo, but haven’t done it yet on the two smaller boxes. I just wrapped, folded, kept cutting, and taped until it was all covered, trying carefully to keep the lines straight, which I somehow managed to do. The top photo below is the lid and the bottom picture shows how it’s all crazy underneath- but that’s okay- it’s the part never seen. 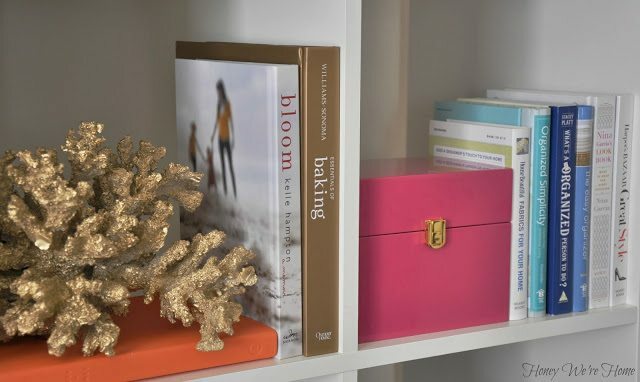 My favorite addition to this bookshelf is my gold coral (an easy DIY update with a can of gold spray paint). I put together a Workout Playlist of 60 songs on Honey We’re Healthy if you need some tunes to spice up your workout. Visit Nestlé® Pure Life® Purified Water FACEBOOK page for a chance to win a trip for 4 to Universal Studios Hollywood or Universal Orlando Resort. 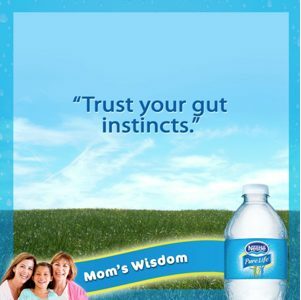 They are also giving away a YEAR supply of Nestlé® Pure Life® Purified Water! Looks fantastic Megan… It definitely spices it up!! Love it. Looks great! 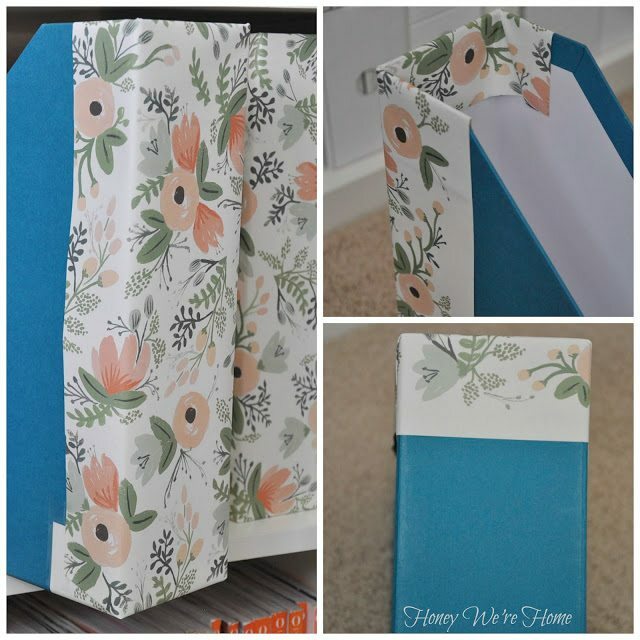 Where did you find the blue open faced organizer for your cards and paper? I'm looking for something similar for my office desk. 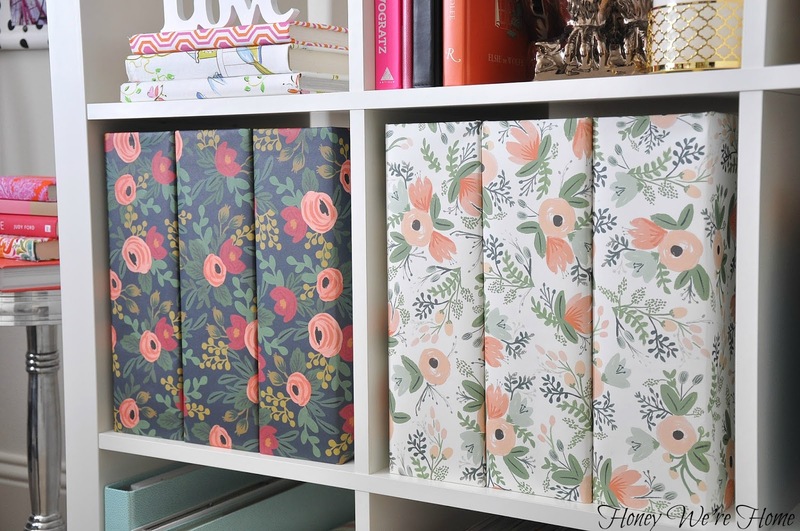 I love Rifle Paper's wrapping paper too & I'm totally jealous of your new gorgeous files! Great ideas! I am ready to mix up my expedite in my office as well. While I still love all the blue and green, I really would love to add additional colors. I too am loving pink right now. Love the coral painted gold!! 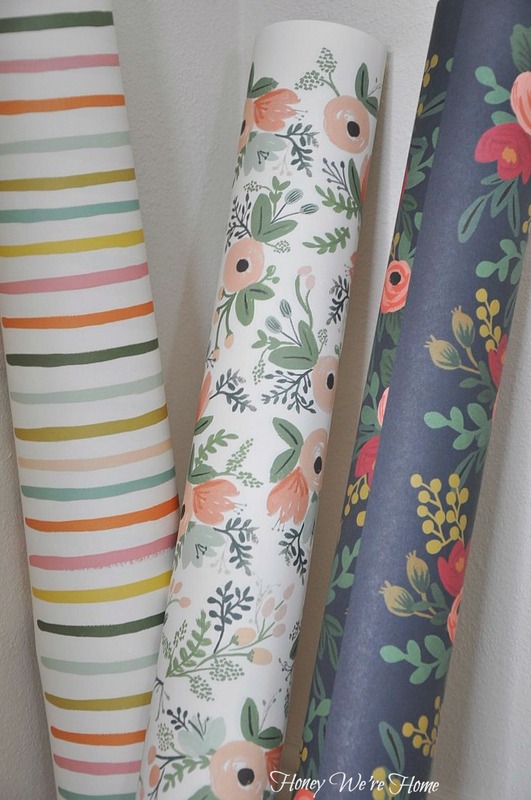 I would never tire of Rifle Paper Co either! Looks fabulous, gal! Just the perfect shot of floral. So cute and such a great idea! Thank you for sharing. I will most likely be trying this in the near future. That wrapping paper is beautiful! Genius! And honestly who doesn't love Rifle Paper?? Looks great! Love the way you've got everything styled! That looks so pretty! I love everything Rifle Paper Co does. Bookplates would finish them off nicely. Genius idea! 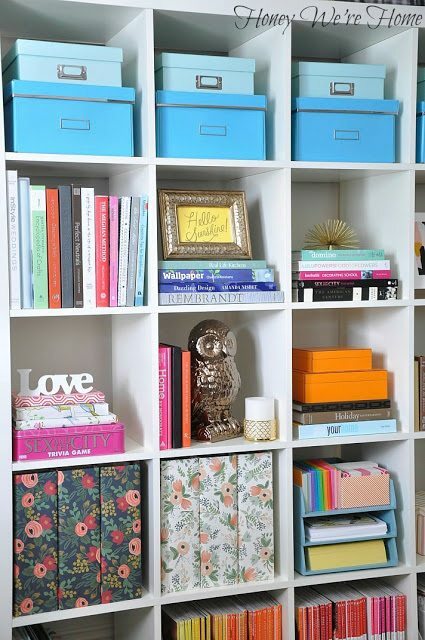 I have some of those boxes in my home office-they def could use a little pick-me-up! Super cute, Megan. 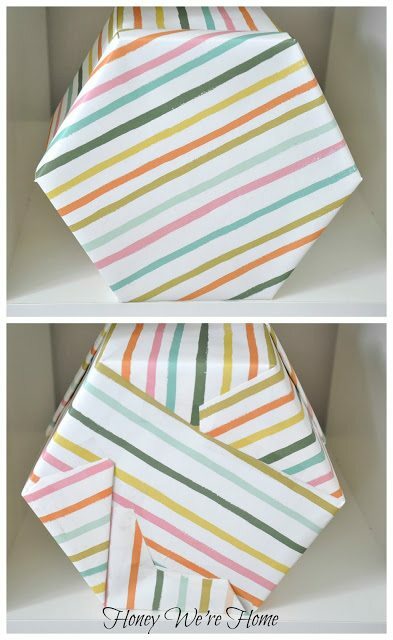 I love those papers and they are perfect for your new color scheme! Looks great! 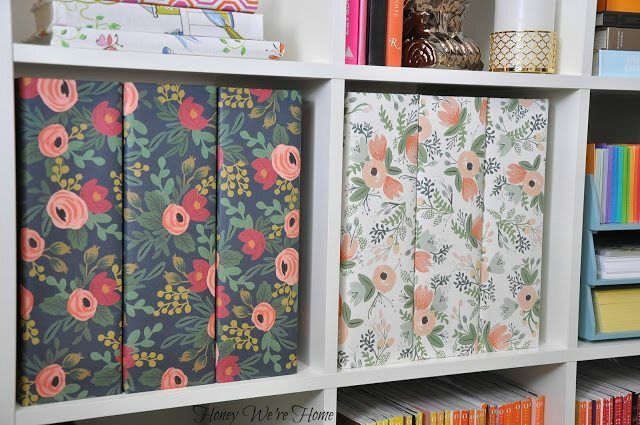 I love the papered boxes!! Shelves look colorful, fun and organized. so pretty, love that paper! love! adds so much character to the shelf! Looks beautiful Megan! I'm loving the painted coral too – it really adds a special something. I know this post was from a while ago, but I stumbled upon it while debating between the two floral papers you used, to back a hutch. I can't quite tell in your pictures and Rifle Paper's – is the dark background a navy? And is the white background actually white, or more off-white/ivory? The answers will help me decide! Thank you!